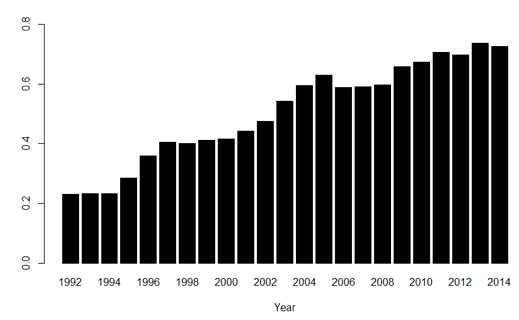 Syndicated loan issuance has grown dramatically over the last 25 years. Over the period, the syndicated loan business model has evolved, affecting the nature of the associated risks that arranging banks are exposed to. This column introduces the concept of ‘pipeline’ risk –the risk associated with marketing the loans during the syndication process. Pipeline risk forces arranging banks to hold much larger shares of very risky syndicated term loans, which results in reduced lending by the arran­­ging bank not only in the syndicated term loan market, but in others as well. Syndicated loan issuance – in which banks partner with other financial institutions to originate large loans – has grown dramatically over the last 25 years. 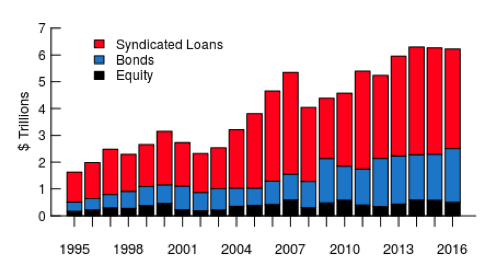 In 2016, non-financial corporations borrowed $3.4 trillion worldwide from the syndicated loan market, making this source of funding significantly larger than the issuance of bonds and equity (see Figure 1). Much of the expansion in syndicated lending has been driven by fundamental changes in the syndicated term loan market. In the early 1990s, a bank that arranged a syndicated loan partnered with other banks to form the term loan syndicate, and the arranging banks kept a substantial share of the loan (20–30%) on its books. With the rise of the originate-to-distribute-to-nonbanks model and the secondary market for syndicated loans, institutional investors such as mutual funds and collateralised loan obligations started to provide additional funding for the syndicated term loan market (Bord and Santos 2012). By the end of 2014, the institutional investors’ share in the syndicated term loan market exceeded 70% (see Figure 2). One consequence of these changes in the syndicated loan market is that the arranging bank nowadays aims to distribute as much of the loan as possible to these institutional investors, and keep very little or nothing on their banks. Currently the arranging banks retain, on average, only about 5% of a term loan. The shift in the syndicated loan business model has also affected the nature of the associated risks that arrangers are now exposed to. While a large literature studies the consequences of loan syndication on the incentives to monitor borrowers (e.g. Sufi 2007), in a recent article we argue that while the sharp decrease in ultimate retention of syndicated loans has reduced the arranging banks’ exposure to traditional credit risk, the shift in the business model generates what we call pipeline risk (Bruche et al. 2017). This is the risk associated with marketing the loans during the syndication process. It stems from the need to underwrite loan syndications, and uncertainty about how much of the loan can actually be placed with institutional investors. Source: Shared National Credit Program. What are the economic mechanisms behind this pipeline risk? We show that the role of an arranger in the new model of syndicated lending is to elicit institutional investors’ willingness to pay a share of the loan, to decrease the interest rate spread when possible, and increase it when necessary to place the loan. 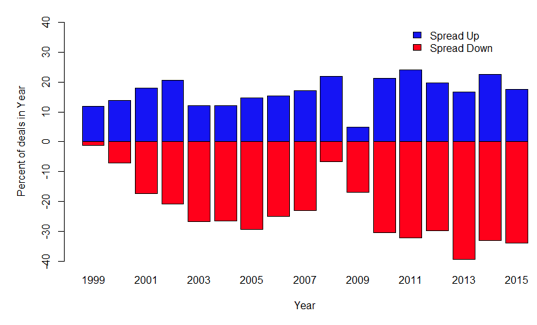 Figure 3 shows that spreads are adjusted either up or down for about 50% of the syndicated leveraged term loans. To induce institutional investors to truthfully reveal their willingness to pay, the arranger must also allocate less of the loan to investors with low reported willingness to pay and more to investors with high reported willingness to pay (Benveniste and Spindt 1989). This second aspect generates risk about how much of the loan can be placed with investors. In practice, borrowers often have little flexibility over the total loan amount, and therefore will require guarantees from the arranger that the necessary funds will be raised (e.g. when a syndicated loan finances an LBO). Consequently, arrangers will often explicitly or implicitly underwrite loans and assume this. Pipeline risk is the risk that arranging banks have to hold much larger initial shares in very risky syndicated term loans that institutional investors find unattractive. Such ‘unfortunate’, larger-than-expected retention of a syndicated loan reduces the bank capital available for lending and causes banks to approach their internal risk or concentration limits. Consequently, we also find that unfortunate retention subsequently results in reduced lending of the affected arranging bank, not only in the syndicated term loan market but in other markets as well. Hence, pipeline risk exposes arranging banks to having to hold much large shares of very risky syndicated term loans, which reduces bank capital available for lending and causes banks to approach their internal risk or concentration limits. Consequently, we also find that when banks have to hold much larger shares, they subsequently reducing lending not only in the syndicated term loan market but in other markets as well. Authors’ note: The opinions expressed here are those of the authors and do not necessarily ‎reflect the view of the Board of Governors or members of the Federal Reserve System. Benveniste, L M and P A Spindt (1989), “How investment bankers determine the offer price and allocation of new issues”, Journal of Financial Economics 24: 343-361. Bruche, M, F Malherbe and R R Meisenzahl (2017), “Pipeline risk in leveraged loan syndication”, Federal Reserve Board, Working paper 2017-048. Bord, V and J A C Santos (2012), “The rise of the originate-to-distribute model and the role of banks in financial intermediation”, Economic Policy Review 18: 21–34. Sufi, A (2007), “Information asymmetry and financing arrangements: Evidence from syndicated loans”, Journal of Finance 62: 629–68. “Loan market in `disarray' after Harrah's upset" Financial Times, 4 February 2008. “Buyout firms lose leverage with backers" Financial Times, 21 January 2016. “Underwriters on the hook after botch" Reuters, 20 November 2015. Unfortunately, we do not observe all bridge loans, which mostly likely causes us to underestimate the severity of pipeline risk. Regulators in the US and Europe have recognised this risk and have issued leveraged lending guidance that explicitly consider pipeline risk.